Arsene Wenger has hinted that we may see more of Chuba Akpom and Alex Iwobi at this weekend’s Emirates Cup, in a tournament usually designed to benefit the first team, the boss told Arsenal Player. Wenger took a 27-man squad to Singapore filled with many players from the development squads, and their involvement in the Emirates Cup may be limited. With the likes of Danny Welbeck also set to come back into the fold – as Wenger confirmed last week (via the Daily Star) – few youngsters will be included in the squad. 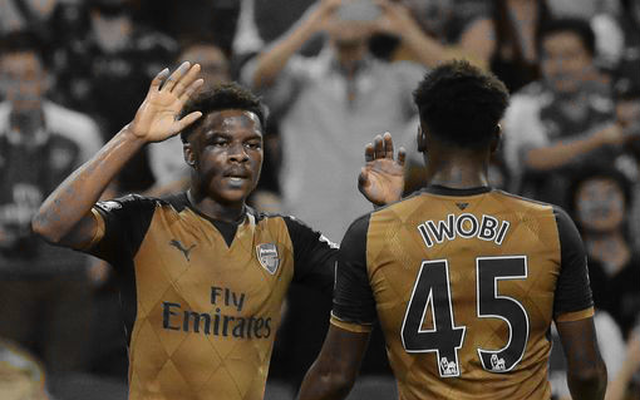 However, the boss has named Akpom and Iwobi as the two starlets who we may see feature against Lyon or Wolfsburg. “The first name that comes to mind [to play] is certainly Chuba Akpom because he has done well on tour,” Wenger revealed. “Maybe two or three more will feature, certainly Alex Iwobi will be very close to making the team for these games as well. It will be interesting to see how many minutes the boss hands the duo almost seven days before our first competitive game against Chelsea in the Community Shield. Wenger will surely want most of our first team players to feature over the weekend, with a view to having an impact at Wembley. However, given that the likes of Calum Chambers featured against Manchester City in the same fixture 12 months ago despite his tender years, perhaps Wenger sees our academy stars doing the same?